Opening Minds through Art (OMA) is an award-winning, evidence-based, intergenerational art-making program. 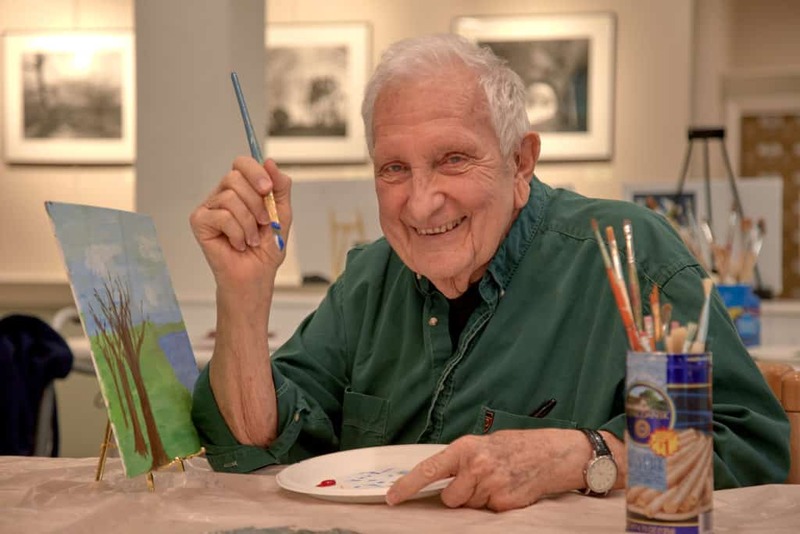 Developed by Dr. Like Lokon at the Scripps Gerontology Center at Miami University in Ohio, OMA is grounded in person-centered ethics and was founded on the fact that people with dementia can express themselves creatively, in this case artistically. OMA’s mission is to build a bridge across cognitive barriers and age through art. Each artist is partnered with a trained volunteer on a one-to-one basis, supporting them but with a step-by-step, “hands-off” approach, so that the artist creates the artwork independently. Collectively, through the OMA journey, we re-think our assumptions about what is possible when living with dementia. Goddard House Community Partnership Director, Ginny Mazur, an art therapist, attended an OMA workshop at a LeadingAGE National Conference, held in Boston in 2015. There, she was enthused by the fail-proof, abstract art techniques for adults that are created and researched by Dr. Lokon and her team. Goddard House received a training grant from the Jane B. Cook 1992 Charitable Trust that sent Ginny to Miami University in 2016 to train to become an OMA facilitator. Thereafter, our community proudly became the first facilitators of OMA in Massachusetts and piloted the full program in our Olmsted Memory Support Neighborhood.